India is considered to be one of the fastest-growing economies. But despite constant changes thanks to the economic boom, the lives of millions living there are still dominated by the daily struggle for clean water. Mumbai is the financial center for one of the fastest growing economies in the world and the heart of India’s beloved Bollywood film industry, but beyond the glitz and glamor there is another story playing out on the streets of India’s most populous city. Shanama Nagappa is 12 years old and her life in Mumbai revolves around finding water. In this slum,where Shanama lives, it is more common to see a satellite dish bringing people cable TV than it is to see a working tap bringing them water. Some 1.2 million people in Mumbai live in unauthorized slums and are not entitled to government services like water. Even after walking hours to get to a tap, people find that the water only runs at specific times for as little as ten minutes.. While the people in Nagappa’s community have managed to find a broken pipe in a gutter not far from their homes, many Indians are spending up to ten per cent of their salaries to buy usable water. Access to water is not just a problem that affects people living in the slums. 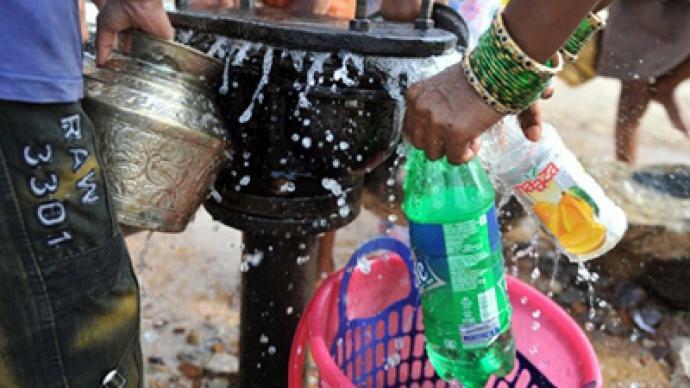 Thirty-five per cent of households in Mumbai receive less than the desired 100 liters of water per person per day and many of those people live in middle class communities. Namrata Namdev Sawant is a Mumbai housewife. Despite living in a more modern apartment Sawant too has to schedule her day around when she can get water. “We get water at 4 in the morning for one and a half hours. Since we just get it for one and a half hours we have to wake up early and get all our work done," says Namrata. Sawant has to fill the tank on her roof during the time the city gives her access to water and if she needs more than the tank of water she is able to fill she is out of luck. Water is an issue that seems to affect everyone in Mumbai, but there is one man who has managed to escape the problem. His name is Mukesh Ambani and he is worth US$27 billion. In his house there are hydroponic hanging gardens, swimming pools and waterfalls. He reportedly uses 500,000 liters of water every month. It is something that angers many Indians. While most are used to seeing the great contrast between rich and poor on a daily basis, they believe that Ambani’s water usage is a waste and think it unfair. “We have come to give him a memorandum and water collected from various slums. If there is a shortage of water, we are willing to give more. We came here to tell him this and protest it,” says one of the participants of the demonstration against Ambani. For those who have no choice but to plan their day around water retrieval it is a painful reminder that even when it comes to basic necessities the wealthy elite still has the advantage. “I feel bad. In our house we get water for only one and a half hours whereas they have enough water the whole day – even to waste it,” complains Namrata. It is a constant battle to meet their daily needs.